Season 2 concludes a series that lasted from September 1971 to March 1974. The international cast paired with the celebrated producer Gerry Anderson (known most for work on “Thunderbirds are Go”) to create a series that captured the smoothness of a 60’s era spy/fi jet setter’s life along with a soundtrack that explores a glimpse of Soul and R&B with powerful groovy Big Bang Brass arrangements. The episodes in Season 2 bounce up and down in quality yet builds into the grand finale, the last 4 episodes take the series out on a high note for me. I did not find many original elements to the scripts, so I watched more intently for the individual actors performances. 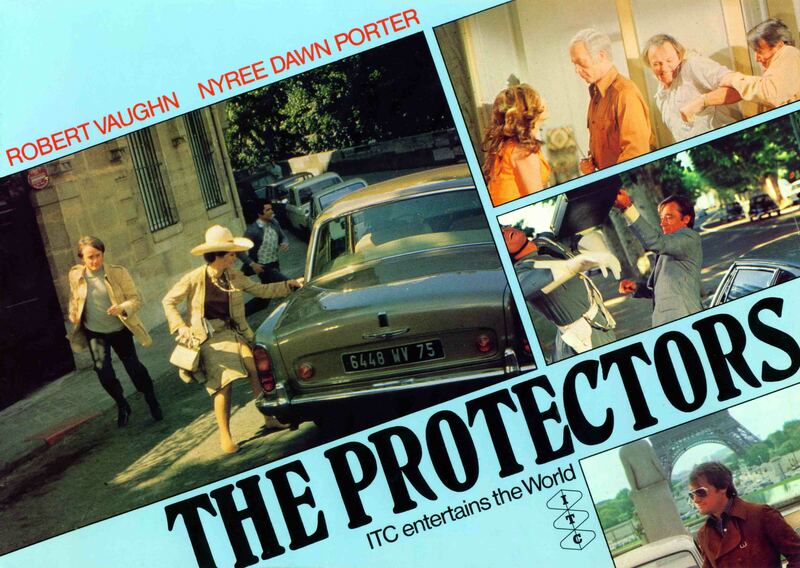 Harry Rule, the leader of the Protectors,played by Robert Vaughn lives in Paris and his two other Protector alumni are the beautiful Contessa di Contini played by Nyree Dawn Porter, a New Zealander working in the UK, and Paul Buchet played by Tony Anholt. The Protectors were hired, sometimes unwillingly, to protect the assets or mysteries of world leaders, corporations and even an old lady. One standout of this series is the selection of incidental music by John Cameron that blends perfectly with the jet set setting and the team of savvy confident investigators. The Protectors was filmed in exotic locations like Malta, Salzburg and Venice as well as the home base in London. At times the screen writers limit the shows potential by writing shows with thin plot lines and convoluted dialogue. But on second view, the episodes clearly mark why this show is still available and enjoyed. It is fun and is a time capsule of its time. A cunning robbery of an armored vehicle and the police are left none the wiser. The Protectors are hired by the security company’s CEO about the series of robberies that his company has been experiencing lately. There have been substantial amounts of Platinum that have been stolen during these robberies. Harry’s suspicions look towards a particular address, the auto dump, and in it Glen Bailey. The platinum is the focus of the Protectors investigation which leads them to unexpected places. I couldn’t help but realise that this episode and story make me think of an old sinister Batman villian with his acid boiling in the background. The flamboyant Glen Bailey adds a touch to this episode which makes a good episode in to a great episode. His wacky attire and his arrogant attitude is a great character to come up against the Protectors. Do watch and enjoy the last episode of The Protectors. A film room has been vandalised and piles of film were set alight. The master negative of a 5 million dollar film is missing and all the other copies were burnt in the fire. The blackmailer brings in a canister of one part of the film’s negative and sets his terms for the release of the remaining negatives. Harry tries to follow this blackmailer as he leaves the office but the crook goes missing. He always goes missing. His hiding spot must be in the building and it must be found before more film burns. Blackmail from within is always a tantalising story and this episode provides an adventure that follows Harry in sorting out the case of the missing film negative. A young man who seeks his gain through such means must be considered a threat in the eyes of the movie company. This is as good as the last three episodes that are finishing off the second season well. An elaborate scheme is being prepared. The Protectors have entered into a race to help their investigation. A Swiss bank is asking the Protectors to help find some missing papers but the copies not the originals. The task requires some papers to be taken, photo’d and given back before anyone knows about it. The race is on to complete the job and is their car fast enough. A somewhat complicated episode to follow. The protectors are working for a Swiss Bank in order to retrieve some documents. The race car scenario is played well, allowing a skillfully arranged swap to take place. This episode is decent and worth your eyes. A singer is rehearsing for her comeback concert but is haunted by strange occurrences when she is alone. Her fears are affecting her singing and even more importantly her state of mind. The ever helpful husband hires the Protectors to identify the cause of these hallucinations. She is afraid of being alone but everyone is suspecting she has lost her mind. Harry finds suspicious evidence that he must follow in order to solve these mysteries. Eartha Kitt shines as Carrie Blaine, a scared and bewildered vocalist, who is taken to the point of insanity by brushes with death. Her performance is matched with Kieron Moore, a great actor on his own, playing Carrie’s husband Mario Toza. An enjoyable episode that is clearly one of the best of the series.